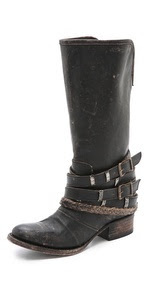 MOST AWESOME BadASS BOOTS for FALL 2013! For someone in the fashion industry I have surprisingly little in terms of clothes and shoes. I rarely shop for myself, but when I do, I buy what I want when I see it, and don't care if it is on sale or not. I don't have time to hang out in the malls and so if I get the chance to go and I see something I like, I just buy it. With that said, most of my clothes I wear and wear until they are rags and the same goes with footwear. My philosophy is "quality over quantity".